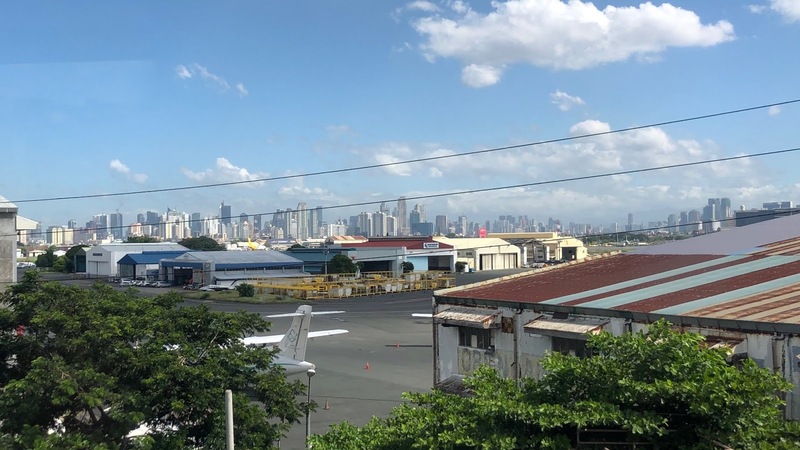 As soon as our plane landed at Ninoy Aquino International Airport in Manila on 4th November 2018, an army of workers were waiting at the gate ready to unload our aircraft. I imagine they had at least double or triple the number of ground staff that would meet a plane landing the United Kingdom. We left to meet two coaches on the arrivals concourse at the front of the airport. It was noisy here. Drivers beeped their horns and we were deafened by almost continuous whistles being blown by traffic wardens and the police. About five minutes into our coach journey, I realised that we were going at quite some speed and that we had been having an exceptionally good run at all the sets of traffic lights. I looked through the front window of the coach and I saw blue flashing lights ahead. I realised that those blue flashing lights were for us; our coaches were being escorted by police motorcycle outriders and other traffic was being stopped for us. We stopped only momentarily to approach a toll road barrier. I looked at the smartly-dressed policemen guarding the toll plaza. They had large-bore guns in their hands - they looked like shotguns. I began to wonder why all this security was necessary, though it was amazing to breeze through Manila insulated from traffic - we felt like royalty! We arrived at the Conrad Hotel on Seaside Boulevard in the Pasay part of Manila Bay. We had to go through security scanners to get into the hotel complex. It was quite late when we arrived so I went straight to bed. 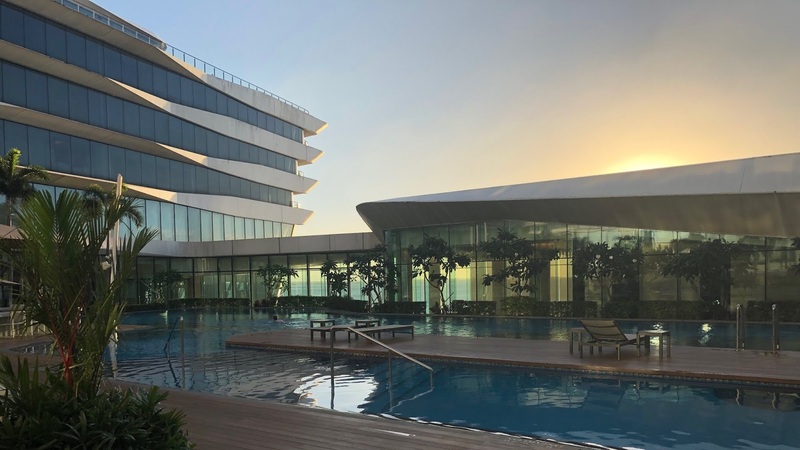 The hotel was an enormous cruise-ship-like structure of white and tinted glass, with a vast floorplan arranged in an S shape. The hotel was certainly impressive and modern. 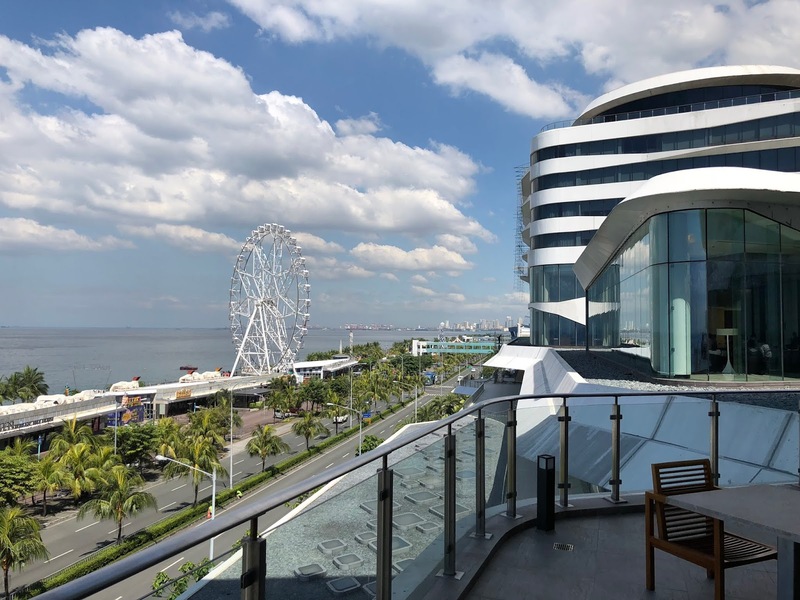 It was just a few metres from the sea and it had excellent views, from the breakfast room particularly, over the distant ships and Manila Bay. The rooms and the service were both very refined. Rooms would be made up in the afternoons and before going to bed. If you remembered to keep the do not disturb sign off, they could offer a turndown service - preparing and refreshing the room before you went to sleep. I’d never stayed in a hotel that did this before. There were electronic controls for the outside blinds and inside curtains, controlled by two switches next to the bed. A soft toy - Conrad the Caribou - was left on your bed each night and in other parts of the hotel the guests would be left impressive towel origami. 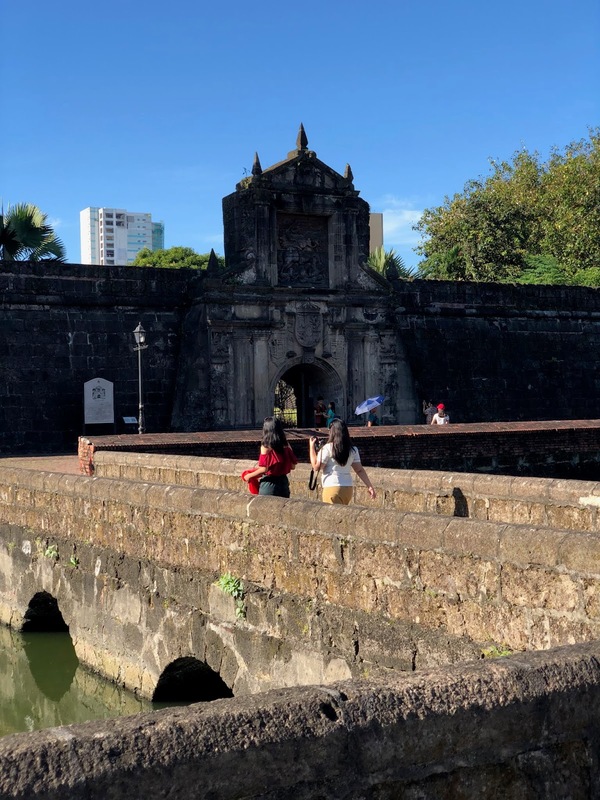 Monday 5th November was our only entirely free day in the Philippines so we decided that we would explore Fort Santiago on the Pasig River. We had a leisurely breakfast before departing. Breakfast at the Conrad was spectacular with excellent French toast and a huge variety of dishes on offer. We organised a Grab taxi for six people, on the recommendation of the friendly concierge by the name of Aldred, who seemed to be already well acquainted with Will - apparently he had helped Will to access the WiFi the previous night. The Grab taxi arrived (Asia’s equivalent of Uber, a smartphone app for booking taxis) and we joined an enormous queue of traffic trying to get along Roxas Boulevard on Manila’s seafront. It was now apparent that we were in the most densely populated city in the world. The trip took about 45 minutes in this traffic but it only cost about ₱400 Philippine Pesos (PHP), or around £0.90 GBP each. Unbelievably good value. We arrived at Fort Santiago in the Intramuros area. This area ‘within the walls’ (Intramuros in Spanish) is the oldest part of the city of Manila. Fort Santiago is an important historical site that has flown the flags of the Spanish, British, American, Japanese and the Philippines since it was completed in 1593. During the Spanish Colonial Period and Second World War it was used as a prison. One of the national heroes of the Philippines, José Rizal, was imprisoned at Fort Santiago before his execution for the crime of rebellion in 1896. Although Rizal did not actively organise it, it was believed that his nationalistic writing incited the Philippine Revolution. Brass footsteps have been screwed into the ground inside the fort to show where he took his final, condemned steps. We visited the José Rizal Museum on-site which was excellently curated, and we walked along some of the fortress walls at the end. After leaving the fort we decided to walk to Manila Cathedral (the Minor Basilica and Metropolitan Cathedral of the Immaculate Conception). 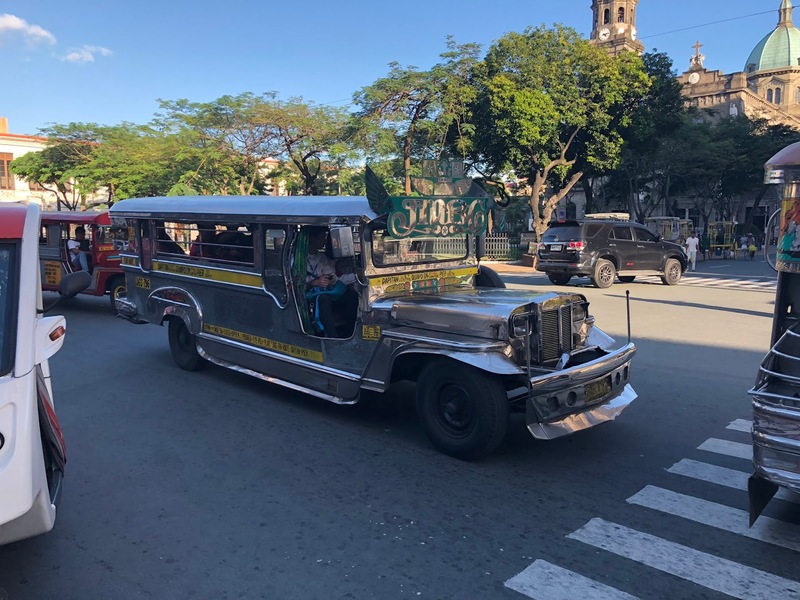 On the way we saw a number of long-wheelbase Jeeps - ‘Manila Jeepneys’ - which offered a crammed-in bus service to an often undisclosed destination. I wanted to try travelling in this way at some point but it would have been total guesswork as I knew nothing about them. I spoke to one member of the orchestra who had travelled in this way (the legendary Bill). He told me it cost only ₱4 PHP (£0.05 GBP) for a trip from near the hotel to the Intramuros part of town. It looked like fun, but it must have been incredibly hot and uncomfortable being packed in with many others in this warm weather. We crossed the road toward the cathedral and had a look around in there. I was amused to see that in the list of former Archbishops, there was one name that stuck out to me: Cardinal Sin. Monty Python would have been pleased with that. We had lunch in the locally-famous Barbara's Heritage Restaurant. It had an old-world charm and traditional Filipino and Spanish food on the menu. We didn’t order much as the Conrad breakfast had been substantial, but what we did have was excellent. After lunch we had hoped to go inside the San Agustin Church, but there was a service taking place so we ordered another Grab taxi and went back to the Conrad. The Conrad was right next to (in fact, directly connected to) the Mall of Asia - a shopper’s paradise with a daily footfall of over 200,000 people. 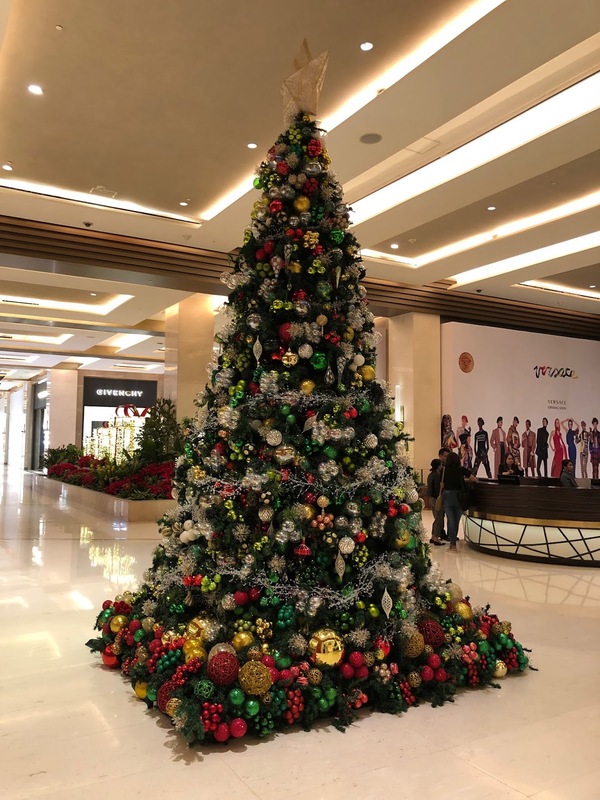 Christmas is a big deal here in the Philippines. I’d watched an episode of Anthony Bourdain’s ‘Parts Unknown’ about Manila and I recalled that Bourdain said Christmas begins in September in the Philippines. This vast shopping centre clearly had Christmas retailing in mind. Now early November, I am sure shops in the UK would have had Christmas stock on display too, but it was amazing to think that they had probably started putting up their Christmas decorations two months ago here! It was fun to explore the Mall of Asia. I bought a few new shirts. I was being interviewed for the Toyota video the next day so I thought I’d better look presentable. Prices were reasonable but sizes were tiny. I had to give up in some shops as I wasn’t going to buy an XXXL shirt out of principle. Thankfully in some other shops I was a more usual size. I had my first experience in a Uniqlo shop, which had shirts in sizes congruent with those in the UK. I quite liked the convenience of the Mall of Asia, but there was only so much shopping, especially hard-sell retailing, that I could take. A group of us shared two large pork knuckles for dinner in the mall - and that was it. I’d had enough of the place for a while, not that you could easily get away from it; the hotel was effectively part of the mall. I enjoyed the hotel though and the pool was beautiful. It was something of a sun spot by day and it was a great place to watch the famous sunset over Manila Bay in the evening. We had our first rehearsal at the Solaire Theatre in Manila on Tuesday 6th November 2018. 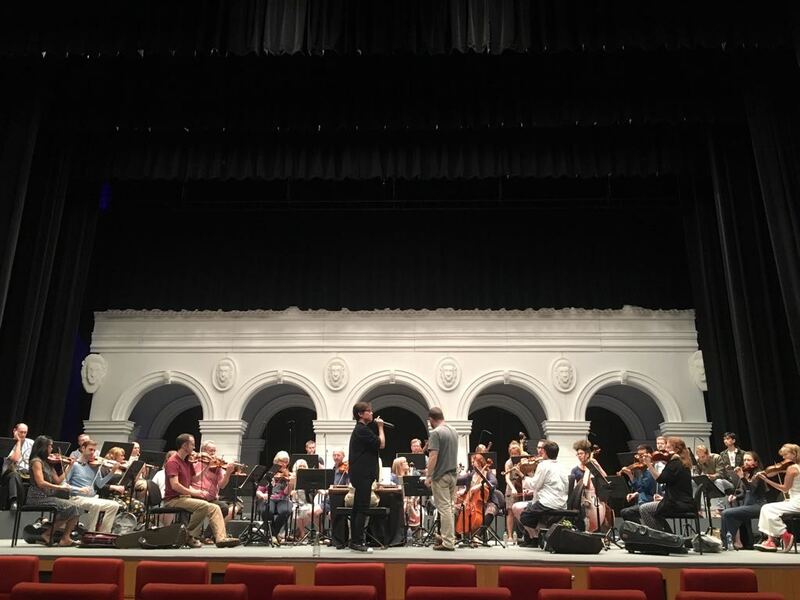 The orchestra rehearsed Bill Thorp’s period-instrument re-arrangements of Mr. Gerard Salonga’s arrangements of Something’s Coming from Bernstein’s West Side Story, On My Own from Boublil & Schönberg’s Les Misérables and I’d Give My Life for You from Boublil & Schönberg’s Miss Saigon. Trumpets were needed in all three of these pieces and we also played in the Filipino National Anthem. We played under the direction of Steven Devine and Bill played the piano part so that Steven, who usually directed from a keyboard at the front, could conduct. I should mention, for all but one of the concerts on this tour we were using a good quality electric keyboard in place of a real harpsichord. A real harpsichord would not have survived the transport as air freight and the humidity would have been an issue too. We rehearsed these pieces without the singer before the break and we were joined by the soloist, Lea Salonga, after the break. Lea Salonga was born in the Philippines in 1971. She is internationally famous for her musical theatre roles as the original Miss Saigon both in the West End and on Broadway. She has performed in Les Misérables on Broadway as both Éponine and Fantine and also has played those parts (respectively) in the 10th and 25th anniversary concerts at the Royal Albert Hall and O2 in London. She also provided the singing voices for two Disney characters: as the starring role in Mulan and as Princess Jasmine in Aladdin. She sang these three pieces with the Orchestra of the Age of Enlightenment. After singing all three, she asked us whether it was any lower in pitch than normal. Our director explained that we were playing at A=415Hz, so it would be a semitone lower than concert pitch. He also explained that we were playing on period instruments and gestured to look over at the horns. The horn players held up their instruments and she said “Wow”. Steven then gestured toward the trumpets; we held our instruments up too. “Oh my God!”, she exclaimed. After I had finished rehearsing I had to go and be interviewed about my role in the ‘Start Your Impossible’ workshops so far. I presumed they wanted to interview me because I taught the Finnish Reindeer Oik and conducted the ad-hoc choir in Phnom Penh. I met the production team who had set up a small studio in an empty corner, front of house, at the theatre. They wired me up with a radio microphone and moved lights to eliminate shadows from my face and began asking me questions. I was clearly not a natural at being interviewed and I stumbled my way through the director’s questions. I really hope they only choose a few snippets from what I said, as I felt flustered and a bit like a rabbit in the headlights. I also kept looking directly at the camera which wasn’t desirable. I think I settled down a bit eventually and I was relatively pleased with my reply to the question about what my advice would be to young musicians. I replied saying that I thought listening was crucial: listening to the advice of teachers, listening to yourself, listening to others and listening to a variety of other voices, instruments and musical styles. Whether you like what you hear or not, there is always something to learn. That was probably my only moment of clarity from the whole interview, so I hope that’s what they use. In my past experience these things always come out looking better than you think they will, so I have every confidence that they will make a great film. They were certainly a nice crew and it was great to chat to them at the airports when our flight schedules coincided. Between the rehearsal and the concert (and also in the break the day before) we had the most amazing gourmet food provided for us in the green room; we were so well looked after on this tour. 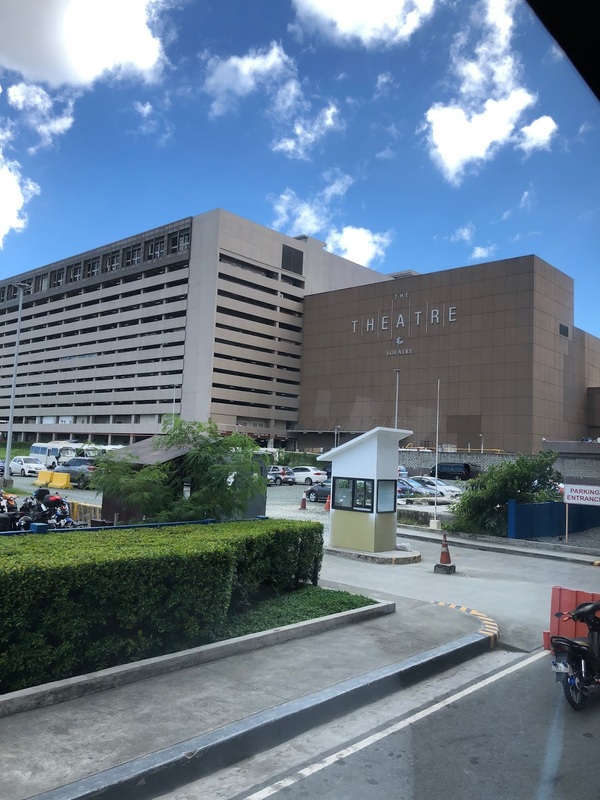 As a result we did not need to return to the hotel between the final rehearsal and the concert, so there was an opportunity to explore another mall which was connected to the Solaire Theatre. Joel (second oboe) and I decided we would have a walk around and see what was in there. Sure enough, we found plenty of enormous Christmas trees and we walked through the casino area too. We were offered free drinks there when we briefly stopped walking, but we politely declined them. People were smoking indoors here so I wanted to keep moving. In whichever direction you looked there were scores of people operating gambling machines and placing chips on tables. It wasn’t my scene at all; it was surreal being in a place without any natural light or clocks. I went back to the theatre after a short while and got ready for the concert. The concert began with the National Anthem of the Philippines - a really characterful tune. Lea Salonga took to the stage to perform her three musical theatre songs. Her first song was Something’s Coming from West Side Story. She chose to sing this piece as it was a century since the birth of Leondard Bernstein. On My Own from Les Misérables was her next choice. She chose to sing this as it was 30 years since she sang it as her audition piece for Miss Saigon. Before her third piece, I’d Give My Life For You from Miss Saigon, she made a heartfelt and very personal introduction. I really enjoyed playing the three musical theatre arrangements with Lea Salonga. She brought the house down and it was an interesting challenge to play this music on the period instruments we had with us. At one point I was playing a trumpet in D at A=440Hz while Will was playing a trumpet at A=415Hz on second trumpet. The Orchestra of the Age of Enlightenment really made it work and we must say a huge thank you to Bill Thorp for his excellent arrangements, to Lea Salonga for her amazing performances, to Steven Devine for leading us, and to Toyota for organising this amazing collaboration. It was a great hall to play in, and the Water Music was so much fun to play. I stayed and listened to the rest of the concert and I loved listening to the horn section - four players playing with two harmonic series to make minor chords on natural horns. Next morning we returned to the noisy concourse at Manila airport. Queueing began way outside the front doors as a security check was required to enter the building. We queued at the check in desk before going through passport control. There was another security check before we were permitted to enter the lounge and yet another security check at the gate. Manila seemed quite intense, but I suppose it is the most densely populated city in the world.